wheelmap.org was one of the finalists in the Open Cities app contest. The Open Cities project is developing and testing open and user-driven technologies designed to improve public sector activities. Seven cities are project partners (Amsterdam, Barcelona, Berlin, Helsinki, Paris, Rome and Bologna) where the ideas are being/ will be tested. One part of the project is organizing challenges for people to develop new applications and technologies. BlindSquare (Finland) – This app helps improve life for blind people. It uses algorithms to decide what information is the most relevant and then speaks it with high-quality speech synthesis. Nice City Pass – This app developed for the City of Nice (France) improves urban mobility by providing realtime info on parking and transport systems (public transport and bike rentals). BikeCityGuide (Austria) – This app offers a complete navigation system for cyclists in cities. I’ve used it in Vienna and it’s quite nice. Toilet Map Vienna (Austria) – This app helps you find a public toilet. It uses open data from the city of Vienna (including information about accessibility) and displays info via augmented-reality. Interestingly, Vienna actually has lots of public toilets. Hogenood (Netherlands) – This app also helps you locate the nearest restroom and includes comments and ratings. PayPark (Spain) – This app allows users to pay for parking in the restricted parking areas (blue zones, etc). 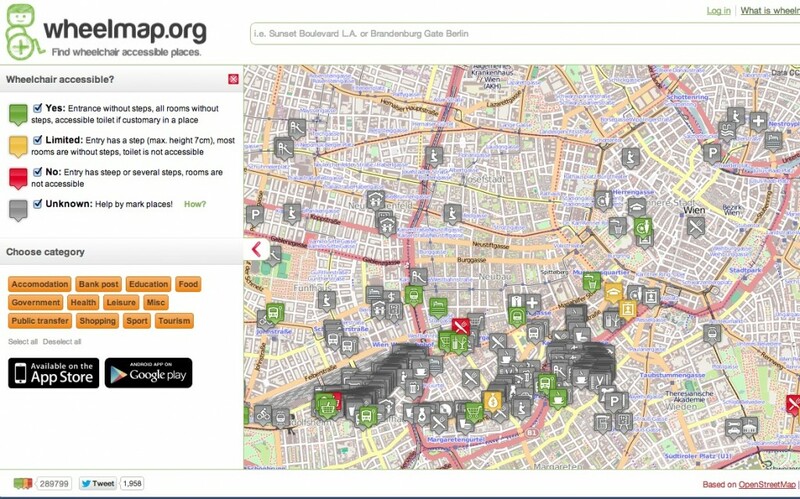 Wheelmap.org (Germany) – You can use this app to find wheelchair accessible places and to add more to the map. It’s built using open street map. Huellasolar (Spain) – This app provides ‘solar cartography’ of Spanish cities. It allows users to identify areas with insufficient sunlight or check annual radiation levels. ComunicaPA (Italy) – This app uses open information to let citizens and businesses speak directly to Italian public administrations, improving information and quality of life. Eureka! (Italy) – This app uses open data from public administrations and presents it as a geolocalized index of life quality on a map. It looks like they are also developing a sensor that citizens can use to feed air quality data to the public (see developer description). I’ll have lots of surfing to do in the next couple weeks to check out all these applications. This was a great idea by Open Cities and I hope they do it again!